- Improved Oral Hygiene — With an orthodontic appliance that is removable, you will be able to clean your teeth much more easily than if you were wearing metal braces. - A Discreet Look — If you consider your orthodontic treatment to be a private matter, or simply feel that metal braces don't fit with your self-image, a practically invisible form of orthodontic treatment might suit you. - More Dietary Choices — To protect metal wires and braces, some diet modifications are necessary. With clear aligners, you can still bite into an apple or a crispy pizza crust. - Comfort — The thin, flexible material of which Invisalign is made will not irritate the soft tissues of the mouth, as metal wires and braces can. - Teeth-Grinding Protection — If you have a teeth-grinding or clenching habit, clear aligners can function as thin nightguards that will protect your teeth from excessive wear. Straighten your teeth without the look of metal braces. 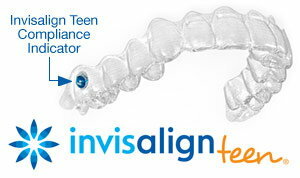 Contact Precinct Line Dentistry in North Richland Hills, TX to schedule your Invisalign Clear Aligner Consultation!